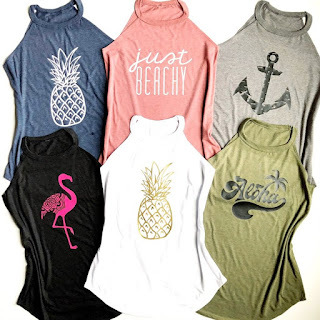 Love these Pineapple Tanks | XS-2X for $14.99 (Retail $29.99). It's SUMMER y'all!! Fashion meets comfort in our ultra soft flowy tank. Features a flattering long flowy length, tri-blend fabric, rib knit high neck and an adorable high/low cut at the bottom. Major cuteness! Pick your favorite design and tank color! 6 design choices! $3.99 for the first item and $2.49 for each additional item. US only. Ships no later than Thu, Jun 21.